12.5" RCOS @ ~f/9 (2880 mm fl) 0.643 arcsec / pixel. Zoomify image scale is 1.28 to 3.33 arcsec / pixel. 8/26/2009 to 10/16/2009 Chino Valley, AZ... with CCDAutoPilot3 & CCDSoft. NGC 281 is an HII region in the constellation of Cassiopeia. It includes the open cluster IC 1590, the double star HD 5005, and several Bok globules. NGC 281 is about 10,000 light-years away. 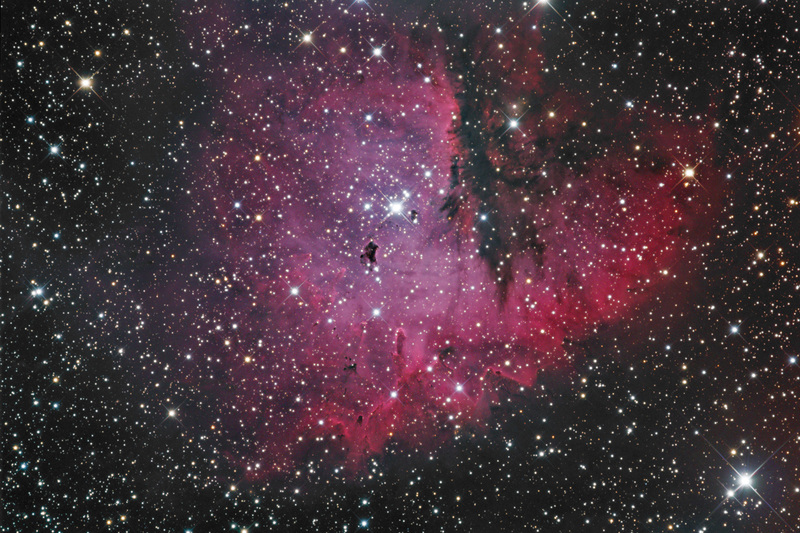 Sometimes called the Pacman nebula, because when viewed though a telescope it resembles the video game character.